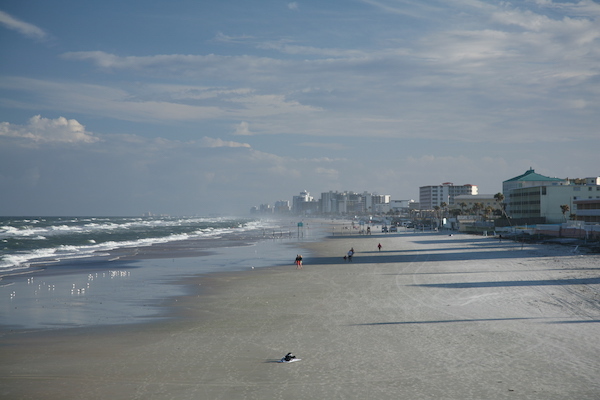 Daytona Beach is one of our absolute favorite beaches for running. With 23 miles of hard, packed white sand and a width of 500 feet in some spots, it’s no wonder that the city has branded Daytona Beach as ‘The Most Famous Beach in the United States’. In fact, the sand is so firm that driving on the beach is both popular — and permitted in sections. The entire beach is public and open to pedestrians. The beach stretches from Ormond-By-The Sea at the north end down to Ponce Inlet at the southern tip of the barrier island (referred to as the peninsula). Just across Ponce Inlet, New Smyrna Beach goes for another 17 miles. We recommend just picking a place on the beach and running as long as you like. The main road paralleling the beach, A1A (Atlantic Ave.), has paths/sidewalks along most of its length in the area and is runnable, but it’s busy and in most spots you’ll see buildings rather than water. For some variety, there are ten parks located along the beach. There are nature trails of 1 mile or more in Lighthouse Point Park (Ponce Inlet), Smyrna Dunes Park (2 miles of elevated walkways), and Michael Crotty Park (Ormond Beach).